It was about two weeks ago that I first saw a dead chicken on the way to work. I was pretty sure it was a dead chicken... but, come on, a dead bird? Yuck. The advert had been on the side of a bus which had whooshed past at speed and I was left with some doubt in my mind. Who would be advertising dead chickens on the side of a bus? A few days later I saw another. A different poster - a brown chicken rather than a yellow one - but clearly a dead chicken. Swiftcovered, heh? At the back of my mind I could vaguely recall a TV advert when a guy trying to arrange his insurance gets very frustrated at a bunch of chickens clucking at him in a call centre spoof. It is the same people. Current affairs have not been kind to Swiftcover. The deadly Asian strain of bird flu - H5N1 - has broken out at a turkey farm in England this weekend. The news is full of images of dead birds being dumped into large trucks. The public is worried. The BBC has interviews with Joe Public who all say they'll be steering clear of poultry. Of course, these people are over reacting, but Joe Public has a propensity to do that. It's just bad timing. Very bad timing. Under no circumstances do you want your brand associated with bird flu. Unless, well, you sell flu vaccinations or health insurance. Unfortunately for Swiftcover they only sell car, travel, dog or cat insurance. I suspect only farmers get chicken insurance. I should remind you that this is a personal blog and opinions here (I have lots of them) do not reflect the opinions of the company I work for. My first reaction to the dead chicken advert was a bad one. Sure - it got my attention - but I didn't think "Ah-ah! Swiftcover!" My first thoughts were "Yuck. Was that a dead bird? What on earth?" A negative response. I don't mind being challenged when it comes to important issues like domestic violence, famines abroad, climate change or drugs but my hackles rise when someone tries shock tactics to sell me car insurance. Given the bird flu outbreak the dead birds seem even less pleasant. As it turns out this isn't the first time Swiftcover's chickens have been used. 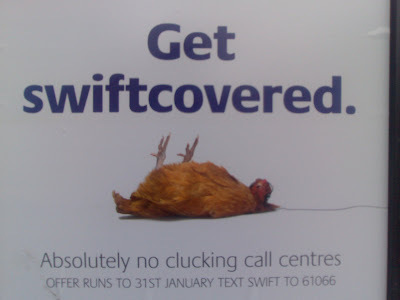 The Register has an article dating back to 2005 which explains that despite 800 complaints Swiftcover was allowed to depict call centre workers as chickens (call centre workers in the UK complained). Now Swiftcover are killing those call centre workers off. Another negative association. I remember the dead birds not the insurance deals. Now the 24 hour news channels are full of H5N1 stories I strongly suspect most of the UK will be noticing the dead birds before they notice the insurance offers too. I do remember the phrase "clucking call centre" though. Simple word games always stick in my head. If I didn't camera-phone a picture of the Swiftcover advert I would have gone to Google to check for that. 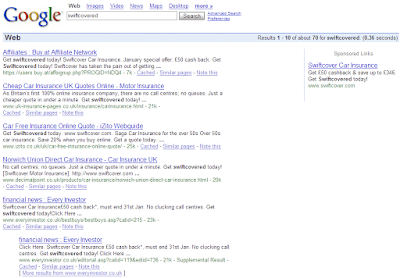 Swiftcover's SEO hasn't done too badly here. They've got the site in at #3 for the search. Swiftcover are doing the right thing by having a page up with their quriky advertising. In fact, I took the chance to review the TV advert I remembered. They should have the videos up at YouTube though. I would have had a web page for every advert. It's the PPC players who are doing badly here. Swiftcover aren't represented at all and this would have been a chance to build that brand message. 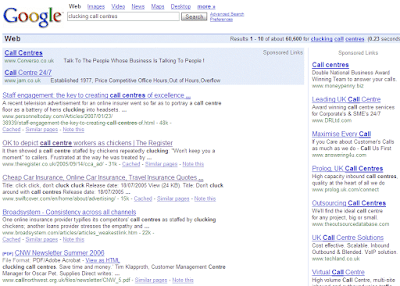 Look at all those pro-call centre adverts who really shouldn't be there. "Clucking" should be a negative keyword for everyone of them. The other "key phrase" is swiftcovered. The name "Swiftcover" doesn't actually appear on the poster (and I'd always encourage people to put the domain in there). What happens if I search for [swiftcovered]? Ouch. On this search the organic results are not kind to Swiftcover. They're not on page one. I suspect my suggestion of having one page per ad on their site would have helped them out here. It's the PPC player (or a big affiliate using Atlas Tracking) who get the position right here. If it wasn't for the AdWord then Swiftcover wouldn't be represented at all. I'm afraid there's not much you can do to future proof your marketing campaign from the random stuff that RealLife(™) throws at you. I suspect some people would encourage brands to stay away from negative images though. All big brands, especially those which live entirely online, need to coordinate their online and offline advertising. When you're creating a buzz phrase or a memorable quote via posters, radio or TV you should be sure you can be found online for the same quote or buzz. It's a must.